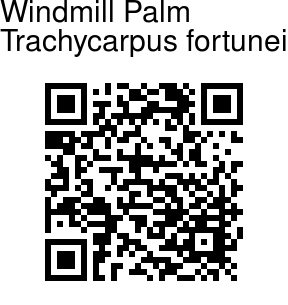 Windmill Palm is a tree that grows up to 12-20 m tall on a single stem up to 15-30 cm diameter. The trunk is very rough with the persistent leaf bases clasping the stem as layers of coarse fibrous material. It is a fan palm with the leaves with the long petiole bare except for two rows of small spines, terminating in a rounded fan of numerous leaflets; each leaf is 140-190 cm long, with the petiole 60-100 cm long, and the leaflets up to 90 cm long. It is a somewhat variable plant, especially as regards its general appearance and some specimens are to be seen with leaf segments having straight and others having drooping tips. The flowers are yellow (male) and greenish (female), about 2–4 mm across, borne in large branched panicles up to 1 m long in spring; it is dioecious, with male and female flowers produced on separate trees. The fruit is a yellow to blue-black, kidney-shaped, drupe 10-12 mm long, ripening in mid autumn. 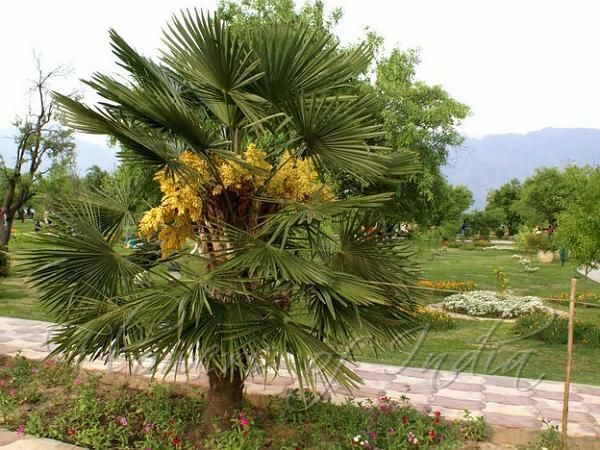 Windmill Palm is native to central China, south to northern Burma and northern India, growing at altitudes of 100-2400 m.
Photographed in Srinagar, Kashmir & Gangtok, Sikkim.